The Grumpy Penguin*: Happy Victoria Day! 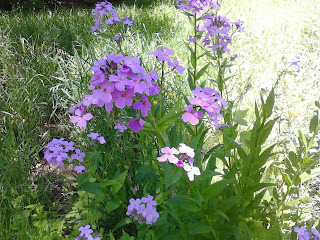 Another "May Two-Four" weekend has come and gone and what an incredible spell of weather we had here in Toronto. Sunny and warm (although not as hot as in the Ottawa Valley, I've heard) each and every day of the first long weekend of the Canadian summer. For those of you reading this who don't understand the significance of this weekend, it's a Canadian statutory holiday that falls on the next-to-last Monday of May every year in celebration of Queen Victoria's birthday. The ol' gal was born on May 24, 1819, which is one of the reasons we call it the May Two-Four weekend; the other reason is because in Canada a case of beer (or 24 bottles or cans) is what we call a "two-four" and this is the first party weekend of the summer at cottages, campgrounds or just the backyards around town where the beers are pretty free-flowing. In any event, it's always the weekend before Memorial Day in the States and it's a pretty big deal to those of us who have survived another bitter winter in the Great White North. 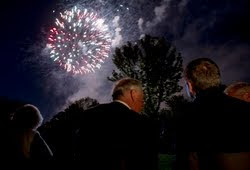 Prince Charles and his wife Camilla arrived in Canada on Sunday and today they took in the huge annual fireworks display at Ashbridges Bay near Woodbine Beach in Toronto. I had thought they were to be moored in the harbour and watching the show from a boat; however, as you can see from this photograph, they were firmly planted on the ground somewhere in the park. We are able to see the Ashbridges Bay fireworks from our balcony a couple of kilometres away (we are 20 storeys up in the air but look straight down Woodbine to the water) so when we heard the heavy bass thumping of the early big bangers we popped outside to take it all in. 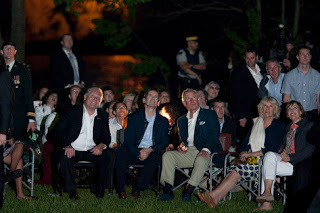 They seemed a bit more lavish this year, which I imagine is to be expected with such an illustrious audience and no, I don't mean Doug Ford. I noticed there were quite a few that seemed to be a purple and gold mix of colours; most likely this was in honour of our royal guests. Earlier in the afternoon Sarah went for a solo walk in Taylor Creek Park which she certainly deserved after putting up with me and my kids all weekend long. She took some wonderful pictures and has graciously allowed me to post a couple of my favourites here as a "guest photographer" for the day. 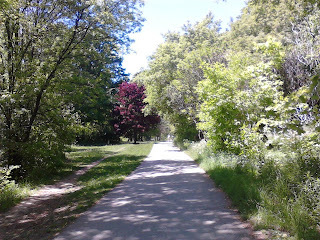 The path in this picture runs through the valley below our apartment building and is an excellent (and cool) place for a stroll, skate or ride in the heat of the summer. It's part of an extensive network of parks that extends from Warden Woods, through Taylor Creek and into Serena Gundy Park where it splits off in two directions, one heading north past the Science Centre, through Wilket Creek Park and on to Edwards Gardens; the other heading south down the Don River Valley to Lake Ontario, where you can continue on to the very same Ashbridges Bay Park. 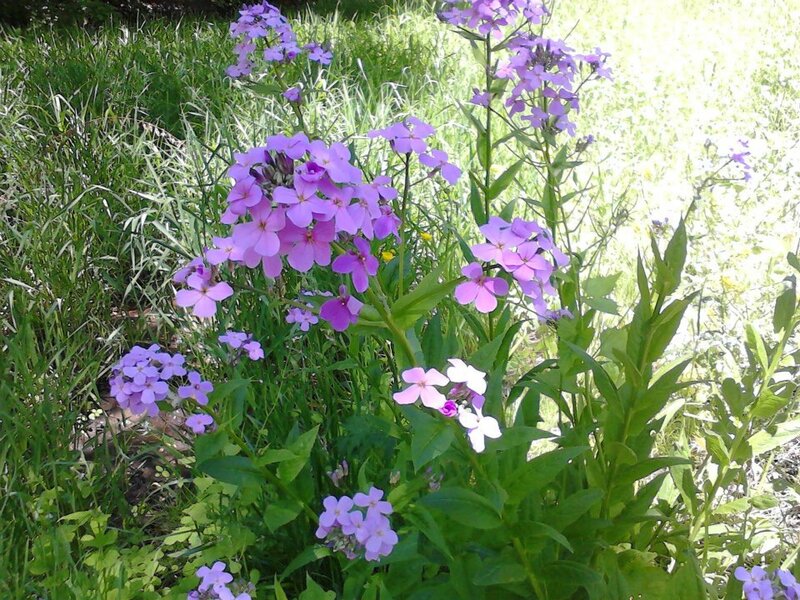 There are lots of flora and fauna along these paths (it's a prime viewing location of the red-winged blackbirds among the bullrushes) and Sarah took a picture of these beautiful wildflowers today. She says there were signs up along the paths explaining that the Parks and Rec department have decided to allow the "natural environment" of these parks to flourish with less interference from them (such as cutting the grass and weeds well back from the path). This might be a clever disguise for a cost-cutting measure, but it's resulted in a much more interesting vista for the people who like to visit these trails. Whatever you were up to, I hope you had a happy and safe Victoria Day weekend! 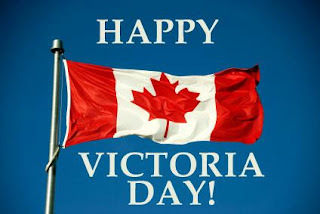 Victoria Day really feels like the beginning of the summer season, don't you think? I've heard that the reason we shoot off fireworks to mark Queen Victoria's birthday is that she was particularly fond of them. What a way to start summer with a "bang"! It really does. It's so weird that in Canada winter doesn't "arrive" until after the first snow usually has hit; spring arrives long before the trees start to bud (most years); and I don't really consider it to be "fall" until around Thanksgiving, yet most of us consider the Victoria Day weekend to be the opening of summer and it's a full month before the solstice! I have heard that about Vickie as well. She sounded like quite a character.